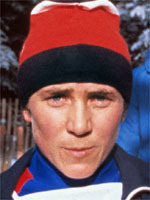 Raisa Smetanina capped a wonderful career when just 12 days short of her 40th birthday she helped the short-lived Commonweath of Independent States team to the relay gold at Albertville in 1992. This Herculean effort underlined her position as the most successful woman at the Winter Games ever, with a total of ten Olympic medals to her credit. She was born on February 29th, 1952 in the former Soviet Republic of Komis, but surprisingly did not begin her attachment with cross-country skiing until she was 15. Five years later, she had joined the national team alongside Galina Koulakova, who was to win three gold medals in 1972 at Sapporo. Her breakthrough came at the 1974 world championships at Falun in Sweden, when she finished third in the 5km race behind Koulakova and the Czech Blanka Pauluand before helping the relay team to the gold medal. Innsbruck in 1976 was the scene of her first Olympic success when she grabbed silver in the 5km race and then triumphed in the 10km event. Victory in the relay gold ensured she left Austria with three medals; a great start to the beginning of her fine Olympic career. The 1978 world championships in Lahti were a disappointment for Smetanina after she could only manage 2nd and 3rd in her favourite sprint events, but the Soviet saved the honour of her country with a sparkling performance at Lake Placid in 1980. Four years later, she ran into some stiff competition at the Sarajevo Olympics when Finland's Marja-Liisa Hamalainen stole the show with three individual golds, leaving Smetanina with a brace of silvers in the 10 and 20km races. Approaching her 36th birthday at Calgary Games, she was still keen to add to her medal collection and finished second in the 10km and third in the 20km race, an all Soviet affair, with gold and silver going to Tamara Tikhonova and Anfisa Reztsova. She decided to have one last stab at glory at Albertville in 1992. Competing for the Unified Team, created following the collapse of the Soviet Union, Smetanina formed part of a formidable relay foursome that included Yelena Valbe, Larissa Lazutina and Lyubov Yegorova that romped to the gold medal. This last dash really was the end of the line for the veteran racer but her record of ten Olympic medals still stands, and will take someone special to break it. Smetanina now spends time travelling and works as a television skiing analyst.